MacMillan, Cyrus. ” The Mermaid of the Magdalenes.” Canadian Wonder Tales. Illus. George Sheringham. New York: Bodley Head, 1918. Print. This rare and wonderful book serves many purposes, acting as a cultural reference point, a book of children’s bedtime stories, and a celebration of art and story. It was released for the Christmas of 1918, primarily for children, but also for all of Canada, at any age, to enjoy and find connection with the country’s history. The book was published by the Bodley Head Company, renowned for the creation of lavish and beautiful volumes. The book binds together thirty two stories that have grown from vastly separate cultural roots, and could, potentially, have lacked a cohesiveness and harmonious through-line to the stories. MacMillan overcomes the challenge of unifying Canadian oral culture by editing the stories in a style more like traditional European fairy tales. It is noted that in MacMillan’s retelling of some of the tales he puts a more distinct euro-centric twist on them, adding elements like wands and spells to induce magical transformation (Eagoff & Saltman, 189). With these changes he is attempting to cater to a wider audience, popularizing the book as a Christmas present – to be shared among children and parents, but also scholars. The book has a universal appeal, both in content as well as appearance, and was an important and necessary contribution to Canada’s cultural archive. The book is also thematically bound together by the consistency of George Sheringham’s beautiful artwork. The images lend a necessary connection in a book of Canadian folktale and history, as MacMillan puts together stories from many different backgrounds.The style of Sheringham’s images are distinctly of the book’s time – the pre art-deco period of the early twentieth century – adding to the appeal for the masses by stylizing old tales with modern imagery. The stories are varied, drawing together elements of Native myths, European stories, French Canadian folklore and Maritime fables. Because of the diversity within the text the images are integral to the successful execution of the book as an anthology, as the stories would feel disconnected and isolated if they were not united by this common link. From Canadian Wonder Tales, the story “The Northern Lights”. Native story with contemporary art deco illustration by George Sheringham. The story “The Mermaid of the Magdalene’s” is one of the maritime folktales within the anthology. The story exhibits all that one might expect of a traditional Maritime tale – beauty, isolation, a gusting breeze and a tempestuous sea – realistic, yet with playful rhythmic poems. The mermaid of the story is an isolated and haunted creature, an object of desire, a haunting ghost on the rocks, ephemeral and fleeting. This would also describe MacMillan’s feeling about these timeless oral folktales when he first heard them – that they were ephemeral and fleeting and would soon be gone if they weren’t fix in print and published for history. As such, the mermaid herself is somewhat emblematic of all of the stories and folktales found in Canadian Wonder Tales, always on the verge of disappearing unless she is kept alive in the hearts and minds of the Canadian people. Mermaids are commonly depicted as women above the hips and fish below (Lindahl, 270). However, is by no means the limit of mermaid representation. In the past, mermaids were called sirens and depicted as bird-women. Sometimes they were envisioned as having the feet of a falcon, tail of a fish, and upper body of a woman (270). The mermaid’s image and moral signification came from religion, through bestiaries and church carvings, and their allegorical role was based on that of the sirens, whose voices were so irresistible that they would lure seafarers to their deaths (270). In MacMilan’s Canadian Wonder Tales the title character of “The Mermaid of the Magdalenes” is represented only through words, there are no images depicting her sensual form. This lack of visual representation reflects the idea that she, like Canadian folklore itself, is only present in the mind of the reader, or listener, of the story. She is real in a way, existing in the stories of sailors; but she is also never really there at all, she is merely a phantom that haunts the shore. This mirrors the idea of Canadian folklore being lost, just as she is lost. The mermaid is represented as an innocent yet naive and self-indulgent young woman, who is slowly being transformed into a fish as a result of her bad deeds: eating the sardines and depleting the number of small fish in the ocean. In the image of the meeting of all the fish of the sea, where they decide the fate of those who eat fish sardines, she is not shown. This stands in contrast to the other mythological women in the rest of the text, who are, by and large, depicted in the illustrations accompanying the stories. This is the only image that accompanies the story, and the choice to leave the mermaid out of it emphasizes her ghost-like nature. She is further represented in the text as a prisoner and phantom of the islands who sits indolently preening herself in a mirror; combing her long hair full of pearls and luring men with her voice. The mermaid is forlorn, vain and perhaps even evil in that she uses her beauty and charms to tempt and trap men, and hold them as play things on her island. In this way, he mermaid in this story is portrayed as a villain of the sea. This stands in contrast to the mermaid often depicted in Maritimes culture, where they are portrayed as guards of boats and fishermen, and keep them safe (Easterlin, 254). “The Mermaid of the Magdalenes” captures a number Maritime issues from the era stemming from modernity and urbanization such as over-fishing and the slow erosion of local folklore taking place in the early twentieth century. In order to better understand the story it is useful to first understand the setting: the islands of the Magdalenes. The Magdalene Islands are a 12-island archipelago in the Gulf of the St. Lawrence, about 130 miles east of the Quebec mainland. They are a small and isolated chain, rising as mere sand banks from the swirling and often turbulent ocean (Soran, 2). They are individually quite small, the largest being slightly more than one mile wide and about two miles long. The history of these Maritime islands is one of seafaring and shipwrecks, themes powerfully captured in MacMillan’s version of the story as well. Within maritime tradition, women were often found to have dockside occupations. This tradition is often seen as excluding women and their voices by limiting female presence to the shore, except for when they are portrayed as villainous creatures of the sea (Persin, 239). The sea, in a sense, represents uncharted territory where the feminine can resist generic and metaphoric boundaries, no longer the passive object of the male gaze but instead a figure of power and control over the sea and the men that travel upon it (240). In the early twentieth century, many issues in the Maritimes concerned themselves with the fishing industry and the over-fishing of sardines and salmon (Mighetto, 532). Mermaids were often used in Canadian folklore during this time to bring attention to this issue. 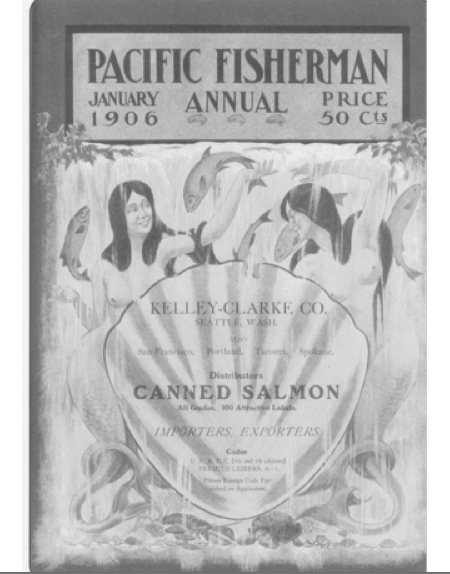 For example in a trade journal called For example in a trade journal called The Pacific Fishermen, images of mermaids were used several times as a way to entice (presumably male) readers on environmental issues such as the decreasing population of salmon (533). The images of the beautiful sea creatures, as seen in the image above, therefore served to symbolize the difficulties that fishermen were experiencing in the early twentieth century. Mermaid images also provided fishermen with a sense of hope and safety while risking their lives at sea, giving them something pleasant to look at while reading about the complex social, economic, and technological issues transforming the fishing industry and the Maritimes. Just as in the story Mermaid of the Magdalenes, the mermaid in the story contributed to the scarcity of sardines. It is through stories such as this that light could be shed on important issues of the current fishing industry. Canada has always found difficulty in defining it’s identity and identifying it’s roots. Even today we find it difficult to specify what exactly “Canadian culture” is, or to clearly describe it’s characteristics. Vast and challenging geography, variations of language, and important cultural differences mark some of the reasons it took us so long so form a strong cultural connection – and what constituted an idea of “Canadianism” was so difficult to perceive. Stories were the preserve of households and small communities, but the task of collecting cultural artifacts on a national scale was not a priority in Canada before 1918. It wasn’t until ethnologists and cultural anthropologists began pressing the issue of folk culture preservation and then conducting research to understand the taxonomy of folklore that the recording of cultural history was recognized as an important endeavor. 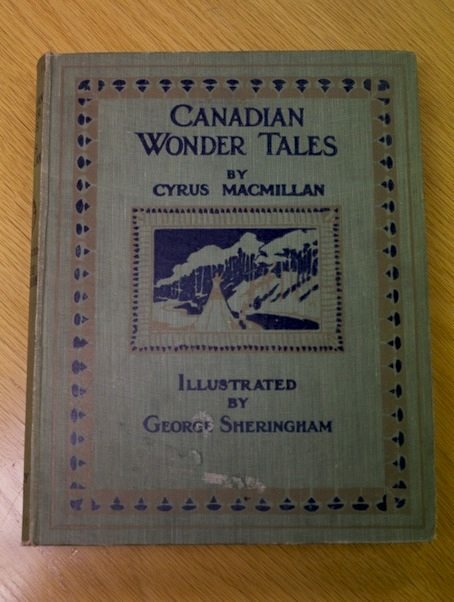 MacMillan, in his investigative journey to uncover our historical Canadian roots, discovered a rich supply of distinctly Canadian stories that rounds out our understanding of Canadian heritage through the preservation of stories in Canadian Wonder Tales. In 1918, the year “Canadian Wonder Tales” was published, the issue of ‘cultural promotion’ was high on the list of governmental shortcomings. Some felt that there wasn’t much history to record, but according to Barbeau, in his 1918 contribution to the Journal of American Folk-Lore titled “Canadian-English Folk-Lore,” this was a misconception due to ignorance and a lack of familiarity with the depth and breadth of Canadian folk tales in the public mind (Barbeau, 2). It wasn’t that Canada had weak traditions or was lacking in oral culture, and certainly it was not the quantity of material that was in low supply. It was simply a lack of successful endeavors to preserve and promote them. Preservation was critical, we began to see, as big city developments had started to pave over rural and heritage stories. MacMillan saw the importance of recording these folktales before they were lost amid the plethora of stories from the thousands of newly landed immigrants and the modern media structures growing rapidly in Canadian cities. MacMillan’s endeavor to record and re-tell the stories was much the same as that of the Grimm brothers in 18th century Germany. He understood that it was important to not only record these pieces of folk history, but also to publish them for mass consumption and contribute to the creation of a sense of national unity and shared identity. Macmillan would have been exposed to the magic of folklore in his childhood as he was a native of Prince Edward Island, a province rich in folklore and strong with tradition. He would have known that many maritime stories, like “The Mermaid of the Magdalene’s,” were drifting away, disintegrating in history. That same pattern was occurring with some stories that had come originally from the Scottish Highlands, but had disappeared from their homeland and existed then only in certain maritime villages (Barbeau, 2). These modest and charming stories help form a distinctive culture did not always have staying power; they were antiquarian, fragmented, and fragile in nature. The Maritime provinces and particularly Prince Edward Island, attentive as they were to their oral traditions (a place where folklore has always flourished) (Barbeau, 2), ran the risk of losing their cultural artifacts to the fast growing fishing and shipping industries. As Canadian industry grew bigger, the threat to unfixed and undocumented tradition grew too. While Macmillan was likely motivated by strong academic and anthropological interests, these were clearly driven by a sentimental motivation that comes from the preservation of cultural artifacts, standing guard for your mother country, and cherishing her past. Sentimentality, at the time the Grimm brothers, would have come forth in the height of Romanticism, at a time when beauty, culture and traditional values outshone rational and utilitarian ideals. Similarly, a century later, at the time of Canadian Wonder Tales publication, Canada was reacting to eighty years of Victorian repression and strict didactic tendencies in children’s literature. It is often said that mass culture and children’s literature mirror one another, and the stories of a nation reveal something of a country’s values, preoccupations and beliefs (Ord, 3). The variation and sharp differences in Macmillan’s collection of folktales do in fact mirror the mosaic of Canadian culture and reflect the divisions between, for instance, Maritime and Prairie culture. “The Mermaid of the Magdalene’s” is one of the few tales collected from the Maritime Islands in this anthology, and it shows us that it is the distinct differences, as much as it is the similarities, that make up the characteristics of Canadian Culture. Canadian children’s literature at this time, was notoriously realistic and moralizing. There was a trend in the first decade of the 20th century on which “practicality” was traded in for the romantic or heartwarming. While the story of the “Mermaid of the Magdalene’s” has many of the qualities that we would expect to see in Canadian children’s literature – it is instructive, moralistic, and exhibits a strong connection to the natural world ( Eagoff & Saltman, 8). The book also projects a romantic notion of Canada, it’s past inhabitants and the mystery of it’s natural world. This is the power of the folktale anthologized, to give us a treasured emotional connection to our home and homeland – a feeling that anthropology and academia comment on but never produce. The mermaid, the central character of “The Mermaid of the Magdalenes,” is both an enticing figure of myth and danger but can also be seen as a symbol of the Maritime fishing industry itself. She brings attention to the problems affecting fishermen during the late nineteenth and early twentieth century, serving as a positive tool for change. The value of collecting oral folktales and stories from the native tradition was not widely recognized in MacMillan’s time. Canadian Wonder Tales both preserves and promotes Canadian folklore by publishing stories of the native oral tradition, tales that would be lost if not recorded. Through this collection of stories, our nation is revealed to us and we are reminded of its core values, goals and beliefs. The centrality of these ideals to early Canadian society would perhaps have been lost to us today, had it not been for endeavors like MacMillan’s Canadian Wonder Tales. Eagoff, Sheila, and Judith Saltman. The New Republic of Childhood. Toronto: Oxford University Press, 1990. Print. Easterlin, Nancy. “Hans Christian Andersen’s Fish Out of Water.” Philosophy and Literature. 25.2 (2001): 251-277. Web. 10 Nov. 2011. Lindahl, Carl., John McNamara, and John Lindow. “Medieval Folklore: a guide to myths, legends, tales, beliefs, and customs.” Oxford University Press, 2000. Mighetto, Lisa. 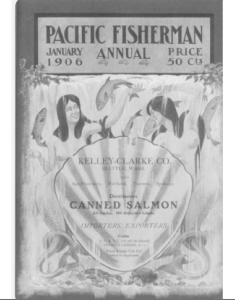 “Lisa Mighetto on Mermaids, the Pacific Fisherman, and the “Romance of Salmon.” Environmental History. 10.3 (2005): 532-7. ProQuest Research Library. Web. 20 Nov. 2011. Ord, Pricilla. “Canadian Children’s Literature: A Cultural Mirror”. Children’s Literature Association Quarterly, 2. 3 (1977): 3 – 6. Project Muse. Web. 14. Oct. 2011. Persin, Margaret. “Mermaids, Pirates, Women And The Sea In Recent Spanish Poetry By Women.” Bulletin of Spanish Studies 84.2 (2007): 239-254. Academic Search Premier. Web. 13 Nov. 2011. Soran, Patrick. “A Canvas of Canada the Magdalene Islands.” Pittsburgh Post – Gazette: F.1. (1998). Web. 20 Nov. 2011.